Geo Librarian: HISSY FITZ GIVEAWAY! THANKS TO EGMONT PUBLISHING FOR SPONSORING THIS GIVEAWAY! 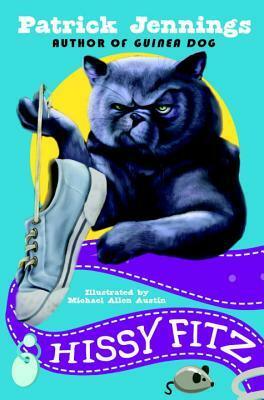 A popular middle-grade writer moves to chapter books with this humorous tale about a cat that makes Grumpy Cat seem cheerful. Perfect for fans of Geronimo Stilton and Dog Diaries. Hissy Fitz lives with some two-legged creatures who are destined to serve him in every possible way and understand his every whim. Sadly, these creatures are sorely lacking in their skills. For one thing--they touch him when they want to touch him. Don't they know that the two-legged are there for him to touch when he wants to--meaning when he wants food? Petting wakes him up! They speak to him--don't they know the two-legged should be seen--so Hissy knows where to order food--and not heard?! It's becoming intolerable. What is this irascible cat to do?